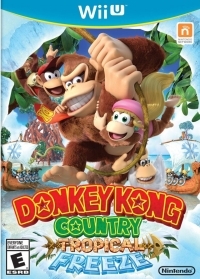 Description: Help Donkey Kong and his friends get back their home from Vikings in the Donkey Kong Country: Tropical Freeze game from Retro Studios. All the challenging ground-pounding, barrel-blasting and mine cart action from the Donkey Kong Country series is back, along with a bushel of new game-play elements and features. Box Text: TAKE BACK DK ISLAND FROM ARTIC INVADERS! Journey with Donkey Kong and friends as you explore lush jungles, sparkling waters... and ice-covered tropical islands?! Cranky Kong And Dixie Kong Join In The Adventure! 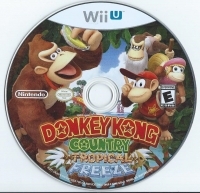 11-22-2014 exonerator Description Help Donkey Kong and his friends get back their home from Vikings in the Donkey Kong Country: Tropical Freeze game from Retro Studios. All the challenging ground-pounding, barrel-blasting and mine cart action from the Donkey Kong Country series is back, along with a bushel of new game-play elements and features. 04-20-2014 pacpix Box Text TAKE BACK DK ISLAND FROM ARTIC INVADERS! An Adventure Spanning Six Unique Islands! 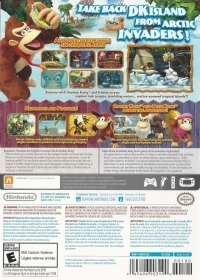 Journey with Donkey Kong and friends as you explore lush jungles, sparkling waters... and ice-covered tropical islands?! New Moves And Features Never-before-seen abilities and breathtaking camera angles combine to produce more dynamic gameplay. Cranky Kong And Dixie Kong Join In The Adventure! Mix and match with Donkey Kong for exciting single and multiplayer action! This is a list of VGCollect users who have Donkey Kong Country: Tropical Freeze in their Collection. This is a list of VGCollect users who have Donkey Kong Country: Tropical Freeze in their Sell List. This is a list of VGCollect users who have Donkey Kong Country: Tropical Freeze in their Wish List.